outstanding invoice balances are posted to the customer account and emails are sent out to the customers. 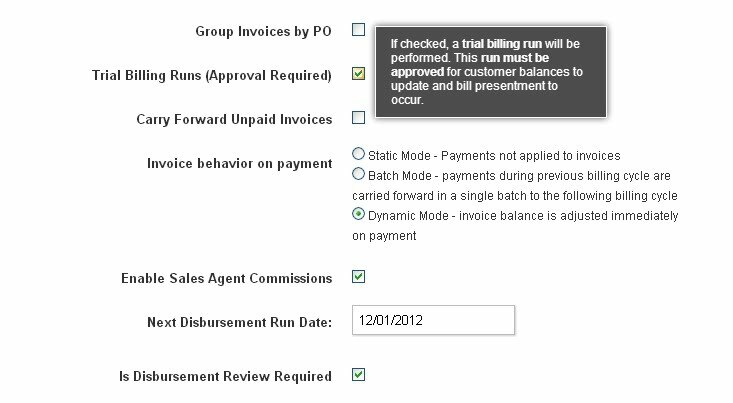 Navigate to “System >> Billing Configuration” menu and select the “Trial Billing Runs with Approval” checkbox as shown below. Fig. 1 – Enabling Trial Billing Runs on the Billing Configuration screen. The amounts from the invoice will not be applied to the Customer’s account balance. The Customer will not be able to see the Draft Invoices when logging in from the self-service portal. needs to be reviewed (the billing runs that need to be approved will be highlighted in pink). See Figure 2. Fig. 2 – Billing Cycles screen. choices seen in Fig 3. Fig. 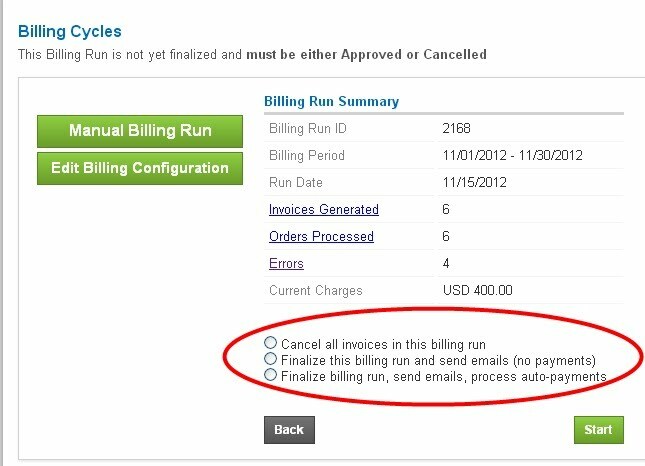 3 – Approve or Cancel the Billing Run. billing run will generate Charges for January again. be processed, even if the customer has a payment method (credit card / ACH) on file. except that payments are also processed.